What kind of Maintenance Can I do On My Aircraft ? The Federal Aviation Regulations (FAR) Part 43, Maintenance, Preventive Maintenance, Rebuilding, and Alteration, permits the holder of a pilot certificate issued under FAR Part 61 to perform specified preventive maintenance on any aircraft owned or operated by that pilot as long as the aircraft is not used under FAR Part 121, 127, 129, or 135. FAR Part 43, Appendix A, Subpart C, Preventive Maintenance, lists the authorized preventive maintenance work. One restriction on such work is that it cannot involve complex assembly operations. 1. A description of the work performed (or references to data that is acceptable to the Administrator). 3. Signature, certificate number, and kind of certificate held by the person performing the work. The signature constitutes approval for return to service ONLY for work performed. The following is a partial list of what a certificated pilot who meets the conditions in FAR Part 43 can do. 1. Removal, installation, and repair of landing gear tires. 2. Servicing landing gear wheel bearings, such as cleaning and greasing. 3. Servicing landing gear shock struts by adding oil, air, or both. 4. Replacing defective safety wire or cotter keys. 5. Lubrication not requiring disassembly other than removal of nonstructural items such as cover plates, cowling, and fairings. 6. Replenishing hydraulic fluid in the hydraulic reservoir. 7. Applying preservative or protective material to components where no disassembly of any primary structure or operating system is involved and where such coating is not prohibited or is not contrary to good practices. 9. Replacing bulbs, reflectors, and lenses of position an landing lights. 10. Replacing or cleaning spark plugs and setting of spark plug gap clearance. 11. Replacing any hose connection, except hydraulic connections. 12. Replacing and servicing batteries. 13. Making simple fabric patches not requiring rib stitching or the removal of structural parts or control surfaces. In the case of balloons, the making of small fabric repairs to envelopes (as defined in, and in accordance with, the balloon manufacturers' instructions) not requiring load tape repair or replacement. 14. Replacing any cowling not requiring removal of the propeller or disconnection of flight controls. The following suggested checklist is one example of how to conduct a preventive maintenance check of a typical general aviation airplane. It is not the only way to check an aircraft. As in the case of any suggested checklist, you should always follow the manufacturer's operating checklist for your specific aircraft. Persons performing preventive maintenance on any aircraft must follow good safety procedures when checking any type of aircraft. This is especially true when checking an installed propeller on an operational aircraft. There is always the remote chance that a defective magneto ground wire could allow a moving prop to start the engine. 1. Spinner and back plate for cracks or looseness. 2. Blades for nicks or cracks. 3. Hub for grease or oil leaks. 4. Bolts for security and safety wire. a. Magnetos for RPM drop and ground-out. b. Mixture and throttle controls for operation and ease of movement. C. Propeller control for operation and ease of movement. d. Engine idle for proper RPM. e. Carburetor heat or alternate air. f. Alternator output under a load (landing light, etc., in the "on" position). g. Vacuum system (if installed) for output. h. Temperatures (CHT, oil, etc.) within proper operating range. i. Engine and electric fuel pumps for fuel flow or fuel pressure. j. Fuel selector, in all positions, for free and proper operation. 3. Remove engine cowling. Clean and check for cracks, loose fasteners, or damage. 4. Check engine oil for quantity and condition. Change oil and oil filter, check screens. 5. Check oil temperature "sensing" unit for leaks, security, and broken wires. 6. Check oil lines and fittings for condition, leaks and security, and evidence of chafing. 7. Check oil cooler for condition (damage, dirt and air blockage), security, leaks, and winterization plate (if applicable. 9. Remove, clean, and check spark plugs for wear. Regap and reinstall plugs, moving "top to bottom," and "bottom to top" of cylinders. Be sure to gap and torque plugs to manufacturer's specifications. 10. Check magnetos for security, cracks, and broken wires or insulation. 11. Check ignition harness for chafing, cracked insulation and cleanliness. 12. Check cylinders for loose or missing nuts and screws, cracks around cylinder hold-down studs, and for broken cooling fins. 13. Check rocker box covers for evidence of oil leaks and loose nuts or screws. 14. Remove air filter and tap gently to remove dirt particles. 16. Check all air-inlet ducts for condition (no air leaks, holes, etc.). 17. Check intake seals for leaks (fuel stains) and clamps for security. 18. Check condition of priming lines and fittings for leaks (fuel stains) and clamps for security. 19. Check condition of exhaust stacks, connections, clamps, gaskets, muffler, and heat box for cracks, security, condition, and leaks. 20. Check condition of fuel lines for leaks (fuel stains) and security. 21. Drain at least one pint of fuel into a clean transparent container from each fuel filter, each fuel tank sump, and any other aircraft fuel drain to check for water, dirt, the wrong type of fuel, or other type of contamination. 22. Visually check vacuum pump and lines for missing nuts, cracked pump flanges, and security. 24. Check crankcase for cracks, leaks, and missing nuts. 25. Check engine mounts for cracks or loose mountings. 26. Check engine baffles for cracks, security, and foreign objects. 27. Check wiring for security, looseness, broken wires, and condition of insulation. 28. Check firewall and firewall seals. 29. Check generator or alternator belt for proper tension and fraying. 30. Check generator (or alternator) and starter for security and safety of nuts and bolts. 31. Check brake fluid for level and proper type. 32. Lubricate engine controls: propeller, mixture, and throttle. 33. Check alternate air source "door" or carburetor heat to ensure when "door" is closed it has a good seal. Check "door" operation. 1. Cabin door, latch, and hinges for operation and worn door seals. 3. Seats, seat belts, and adjustment hardware. 4. Trim operation for function and ease of movement. 5. Rudder pedals and toe brakes for operation and security. 7. Control wheels, column, pulleys, and cables for security, operation and ease of movement. 9. Heater and defroster controls for operation and ducts for condition and security. 10. Air vents for general condition and operation. 11. Windshield, doors, and side windows for cracks, leaks, and crazing. 12. Instruments and lines for proper operation and security. 1. Baggage door, latch, and hinges for security and opera-tion; baggage door seal for wear. 2. Battery for water, corrosion, and security of cables. 3. Antenna mounts and electric wiring for security and corrosion. 4. Hydraulic system for leaks, security, and fluid level. 5. ELT for security, switch position, and battery condition and age. 6. Rotating beacon for security and operation. 7. Stabilizer and control surfaces, hinges, linkages, trim tabs, cables, and balance weights for condition, cracks, frayed cables, loose rivets, etc. 8. Control hinges for appropriate lubrication. 9. Static ports for obstructions. 1. Wing tips for cracks, loose rivets, and security. 2. Position lights for operation. 3. Aileron and flap hinges and actuators for cleanliness and lubrication. 4. Aileron balance weights for cracks and security. 5. Fuel tanks, caps and vents, and placards for quantity and type of fuel. 6. Pitot or Pitot-static port or ports for security and obstruction. 2. Scissors and nose gear shimmy damper for leaks and loose or missing bolts. 3. Wheels and tires for cracks, cuts, wear and pressure. 4. Hydraulic lines for leaks and security. 5. Gear structure for cracks, loose or missing bolts, and security. 6. Retracing mechanism and gear door for loose or miss-ing bolts and for abnormal wear. 7. Brakes for wear, security, and hydraulic leaks. 1. Brakes for proper operation during taxi. 2. Engine and propeller for power, smoothness, etc., during run-up. 3. Engine instruments for proper reading. 4. Power output (on takeoff run). 6. Gear retraction and extension for proper operation and warning system. 7. Electrical system (lights, alternator output). 10. Avionics equipment for proper operation (including a VOR or VOT check for all VOR receivers). 11. Operation of heater, defroster, ventilation, and air conditioner. 1. Ensure that the aircraft is in compliance with all applicable Airworthiness Directives (AD) and the compliance has been properly recorded in the aircraft records. If the AD involves recur-ring action, you should know when the next action is required. 2. Comply with recommended service bulletins and service letters. These are recommendations unless an AD requires compliance. 3. See that a current FAA approved Flight Manual or Pilot's Operating Handbook with all required changes is aboard and that all required placards are properly installed. 4. Check that the Certificate of Airworthiness and Aircraft Registration are displayed. Check for a FCC radio station license is aboard if any type transmitter is installed. 5. Verify that all FAA required tests involving the transponder, the VOR, and static system have been made and entered in the appropriate aircraft records. It pays to take good care of your engine. Good maintenance is not cheap, but poor performance can be disastrously expensive. If you are unqualified or unable to do a particular authorized job, you must depend on competent and certificated aircraft maintenance technicians to perform the job. Always use FAA-approved parts. You can save money and have a better understanding of your aircraft, if you participate in the maintenance yourself. If you do some of your own preventive maintenance, do it properly. Make sure you complete the job you start and make all of the required record entries. Money, time, and effort spent on maintenance pays off. It also ensures your aircraft will have a higher resale value, if you decide to sell. Remember, a well cared for aircraft is a safe aircraft. 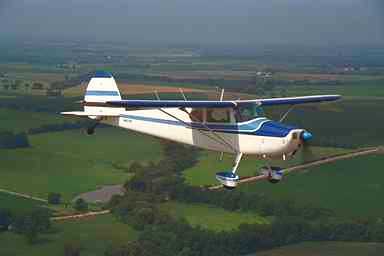 A safe air-craft needs to be flown by a competent and proficient pilot. Maintain both your aircraft and yourself in top-notch condition.